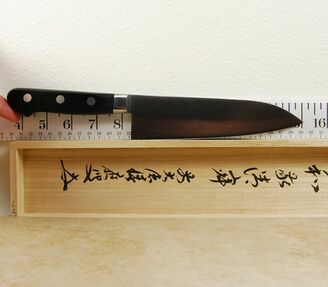 The Konosuke HD line of knives is one of our most popular. They have earned a deserved reputation as great cutters that are easy to maintain and sharpen. The knife is a true laser, constructed from HD2, a semi-stainless tool steel that is easier to care for than other equivalents made from high carbon steels. It should be noted that it will patina over time or, of course, you can keep it polished! The heat treat on the blade is in the range of 61 HRC. 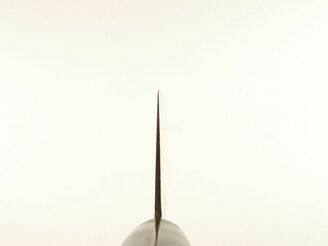 In keeping with the term laser, it is not only thin at the spine, but it is insanely thin behind the edge. Add to this the wonderful grinds imparted on the blade, and you have a knife that almost defies description in terms of its supreme cutting abilities. 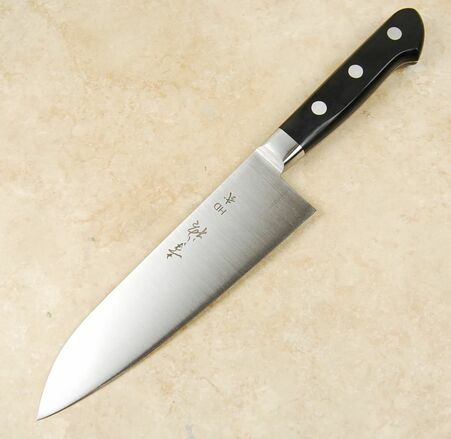 In an unusual twist, the Konosuke HD2 Santoku is mated to a Western style yo handle made from black pakka wood. The stainless bolster and handle combination are finished to the usual impeccable standards that Konosuke is famous for. 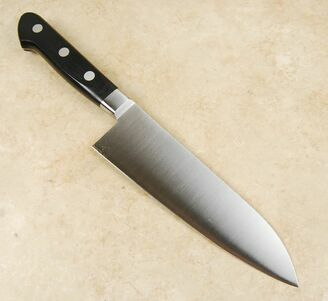 The result is a santoku of superb abilities and looks. It is really a knife for all seasons and due to the ease-of-use quotient, one that will find favor with all sorts of end users.